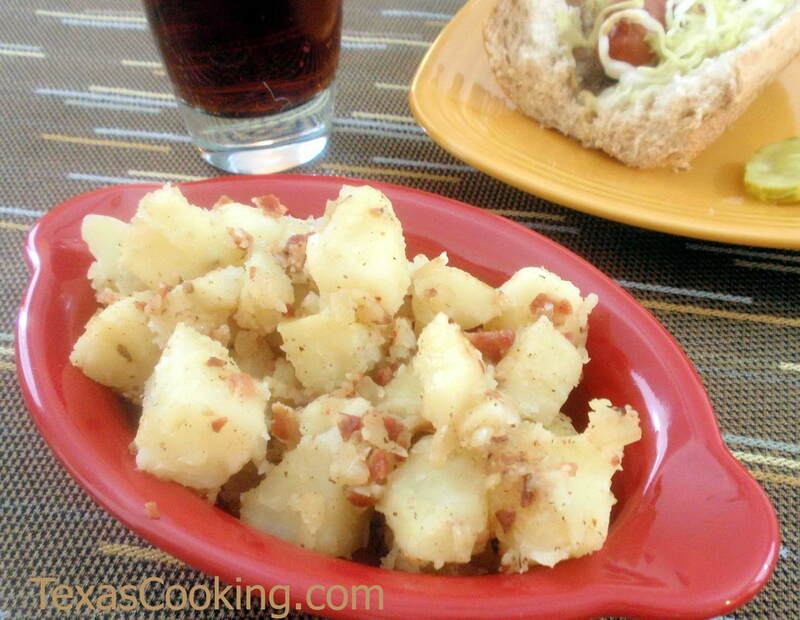 Unlike traditional potato salad in the South, the German make theirs using vinegar and bacon bits. It's also served warm. Enjoy this with brats and a cold Texas beer. Peel the potatoes and cook in salted water (1 teaspoon salt) just until they can be easily pierced with a fork. Drain. When potatoes are cool enough to handle, cut into bite-size pieces. Combine vinegar, sugar and remaining 1 teaspoon salt, and set aside. In a large skillet, fry the bacon until crisp; remove and crumble. Drain bacon drippings from the skillet reserving 1/4 cup. Return 1/4 cup bacon drippings to skillet, and sauté the chopped onion just until softened. Add the vinegar mixture to the skillet and bring to a boil. Immediately add the chopped potatoes and crumbled bacon. Gently toss until heated through. Add black pepper to taste, and serve at once. Note: This recipe makes about 8 generous servings. However, in the unlikely event you have any left over, it's great, served cold, the next day.